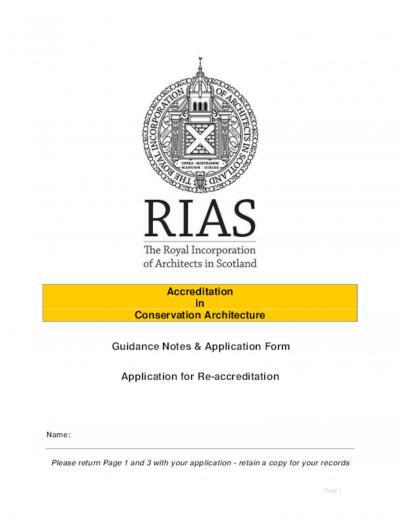 Since 1995, the Royal Incorporation of Architects in Scotland has offered accreditation in building conservation to its members as a means of meeting the requirements of funding bodies, employers and clients. 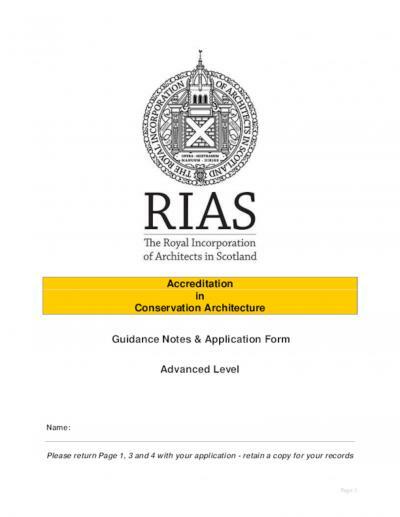 RIAS Conservation Accreditation demonstrates that architects are suitably qualified and experienced to act as the lead professional in grant aided conservation work. Accreditation ensures that all RIAS members have a route by which they can demonstrate their extensive knowledge and experience in conservation work. It also demonstrates their personal competence to administer grant aided conservation schemes and provides a forum for conservation specific continuing professional development (CPD). Individual Members are accredited. Applying for Conservation Accreditation requires information about the member's career, qualifications and further areas of study or professional development. This is supported by case studies and information demonstrating the application of judgement and the member's particular role. Assessors also require evidence of current conservation CPD. Applications are assessed by two members of the RIAS Conservation Assessors Panel which brings together senior RIAS members with extensive conservation architecture expertise. If necessary, applications may be deferred with advice given on the required steps to clarify the information or re-submit. Assessors may defer if, for example, they are seeking better information, more appropriate cases or clarification of the applicant's role. If an application is deferred twice, it will be refused. The applicant will then be advised on the Panel's reasoning. At this stage, the applicant may refer his concerns to the President for independent adjudication. Standard - Competent in Working in the Historic Built Environment. Senior - Recognised Conservation Specialists. ‘Accredited’ members may apply for an upgrade to ‘Advanced’ if they meet the eligibility criteria (refer to application and guidance). Once accredited, RIAS members will be expected to retain active RIAS membership. This process is designed to identify those architects who possess the necessary knowledge, skills and experience to be accredited in conservation architecture. Architects with a genuine interest, usually within five to ten years of registration are invited to apply to be accredited by the RIAS. Accreditation will be by a process of peer review by two assessors selected by the RIAS at least one of whom will be an accredited architect. The information presented in the individual’s application will be confidentially assessed against six core ‘competencies’ agreed by the RIAS Conservation Committee. The Competencies shown on the Assessor’s feedback form are based on the ICOMOS Guidelines for Education and Training in the Conservation of Monument, Ensembles and Sites; these are agreed as the basis of assessment of applicants’ experience as part of the Home Countries Protocol. Applicants will be accredited at one of two levels “Accredited” and “Advanced”. The applicant should decide at what level they feel eligible to apply for, based on the requirements set out in the application and guidance notes. Applicants are asked to submit written and illustrated evidence of their own choosing of their education, training, career history, relevant study, knowledge, special interests and projects in order to demonstrate that they have the necessary theoretical and practical knowledge, skills and experience to be accredited. For each level of accreditation, evidence of recent experience is vital. To ensure that knowledge is up to date, a number of the projects (refer to application form and guidance) described must have been carried out within the last five years. Practising members of the RIAS applying for accreditation or an upgrade in conservation architecture will be required to pay a fee of £180 (inc. of VAT) for their application. This fee is to cover the costs of assessment and is non-refundable. Architects who are not members of the RIAS will be required to pay a fee of £270 (inc. of VAT). Re-accreditation fees are £120 (inc. of VAT) for RIAS members and £180 (inc. of VAT) for non-members. The RIAS have a pilot Mentoring Arrangement to help individuals interested in obtaining conservation architecture accreditation, but who typically do not have an accredited colleague within their practice to help guide them, or who have set up as a sole practitioner. For further information on the pilot scheme, and the criteria to take part, download the document at the bottom of this page. Following the UK statutory bodies' joint re-appraisal of accreditation schemes in conservation architecture the Incorporation will now monitor the performance of its conservation accredited architects. 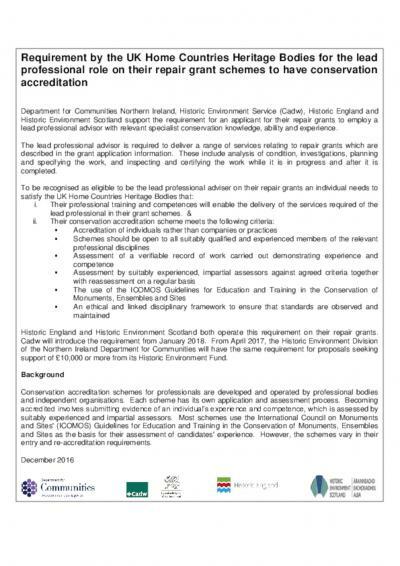 All accredited individuals will be invited to re-apply on a five-yearly basis to ensure their continued compliance with the standards set out by the Incorporation's conservation assessors group and agreed by the RIAS Council. Additional information designed to offer assistance and guidance to professional practitioners, including architects, preparing for accreditation is available via the Understanding Conservation online resource. Download the appropriate application form with guidance notes ie. Accredited, Advanced or Re-accreditation. In addition to the application forms, there is a ‘Suggested Case Study Approach’ prepared to assist applicants in compiling their case studies.